Bethesda’s latest ‘Inside the Vault’ blog post shared further details on Patch 7, coming next week to Fallout 76. We already know it will add brewing and distilling to the game, but there’s far more to it. For instance, energy and heavy weapons are being buffed, while C.A.M.P.S. may now be larger due to the decreased budget cost of certain objects. However, some limitations will be introduced when it comes to the locations available to C.A.M.P.S. For heavy and semi-auto energy weapons, we’ve greatly reduced the amount of condition damage they take per shot. Your heavy energy weapons should now last four to five times longer, and semi-auto energy weapons should last twice as long before needing repairs. We’ve also given semi-auto energy weapons an additional damage boost of +10% so they have a little more bite. We’ve reduced the fire-rate for high rate-of-fire automatic heavy weapons across the board and increased their damage by +10%. Adjusting these weapons’ fire-rates gave us more room for a damage increase, which will help them punch through armor more effectively without increasing their baseline damage per second too high. Weapon damage for all other automatic heavy weapons has been increased by 10% to 20%. Like energy weapons above, we’ve significantly reduced the condition damage that automatic ballistic heavy weapons take per shot, and they should now last about four times longer before they need to visit a weapons workbench. We know that many of you have also been asking for weight changes for heavy weapons. While we haven’t addressed this in Patch 7, we do plan to make improvements with a future update and we will let you know as soon as we have more details to share. C.A.M.P. and Workshop Budget Adjustments: In Patch 7, we’re planning to make adjustments to the C.A.M.P. and Workshop budget system that should allow you to build even bigger and fancier Wasteland abodes. The amount of budget space that some buildable objects consume, such as Turrets and Lights, has been reduced, but they now also have a maximum amount that can be placed in your C.A.M.P. or Workshop. The build menu recipes for these objects will show you how many are already present in your C.A.M.P., including the ones you have stored, and the total amount of each you can place. There are several important aspects of C.A.M.P. and Workshop budgets we must keep in mind when making adjustments, including how objects are used by players, overall structure balance, and even game performance. While the above changes aren’t a direct increase to budget size, they should give you more overall budget space to build lots of cool stuff, while also allowing us the flexibility to further refine and improve balance and performance. C.A.M.P. Placement Adjustments: Occasionally, when we bring new content to the game, it may need to be placed somewhere that was previously usable as a C.A.M.P. location. We can’t have C.A.M.P.s and quests occupying the same space and while we do our best to limit these cases, sometimes it’s unavoidable. Starting with Patch 7, and in future updates, we plan to add a few new “no-build zones” to the game world that will prevent players from constructing C.A.M.P.s in those areas. However, it’s possible some players may have already built in these locations before they became no-build zones. When this happens, affected players will be notified upon joining a world that their C.A.M.P.s can no longer be placed, and they will be given a free C.A.M.P. placement as a result. We don’t expect this will impact most players, but we hope this free move will help you find a new home for your home. Challenge Tracking: With Patch 7, we want to make challenges easier to keep an eye on as you make progress toward completing them, so you always know when that next reward will be on its way into your pocket. We’re adding a new challenge tracking interface to the Map, which you can use to quickly access the challenges menu whenever you’d like. As you scroll through your available challenges, you can now select and add them to the tracker, which will update as you make progress toward completing each one. Additionally, you will also receive a notification in-game whenever you make progress toward one of the challenges you’ve added to the tracker. 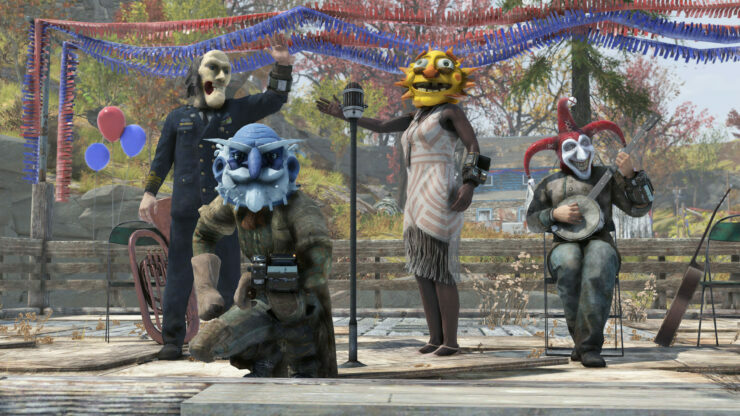 Additionally, the first Fallout 76 seasonal event, the Fasnacht Parade, will be added the following week. Available for a limited time only (from March 19th to March 26th), it’s an event quest happening in the hamlet of Helvetia where players will have to aid Protectrons in the preparations. Should they succeed, they’ll receive some exclusive Fasnacht masks.